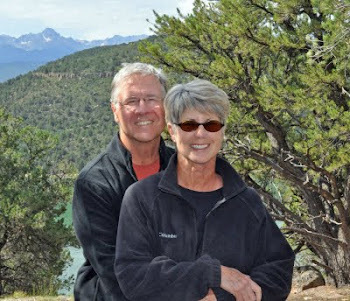 Find us on Google+ Rick and JoAnne's RV Travels: OK…this is some kind of work! Well by the title you would think we are non-stop, however not the case at all! Saturday we did “our rounds” in the morning, again in mid-afternoon, and once more in the early evening. Therefore, we had tons of time to hang out, take a few small hikes, photos of wildflowers, and enjoy our first campfire with a beautiful sliver of a new moon shining through the trees. Sunday, today we had an added duty in addition to rounds. We had swim beach duty! Now before I go any further…NOOOOOO it is not like “Bay Watch.” Beach duty involves sitting at the beach and making sure no one breaks the rules. There aren’t many, but these are the top ones: NO dogs on the beach, NO fires on the beach, NO fishing on the beach, NO glass allowed, and the biggie…STAY within the buoy lines. It’s merely a precautionary measure to prevent any accidents and be present in case there is an emergency. Moreover, the best part of all is we get a big ole bullhorn!!!!! However, with the water levels in the lake so low waiting for the run-off, the water was extremely cold, and hardly anyone showed up! Then back to camp, took a nap, a short hike and wrote this blog. Of interest, when you see the photos of the mountains, they make look a bit hazy and that’s because we are getting the smoke from the Arizona fires, along with the smell. Maybe the winds will pick up and clear the valley.